A betting exchange differs from a traditional bookmaker in that when placing a bet on a betting exchange you are placing a bet with another person, whereby at a traditional bookmaker, you are placing a bet with the bookmaker themselves. In the following article I will explain how they work, how an exchange makes money and some simple trading techniques. 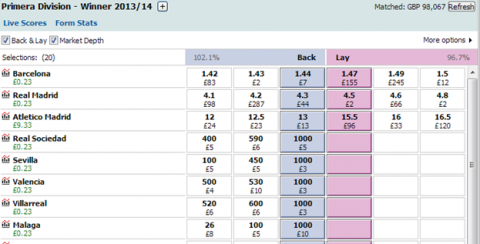 As you can see from the market above, this is the betting market for the 4.00 at Kempton, a 7 runner race. You’ll notice immediately that the left hand side is coloured blue, and is the “back” side of the market, and the right hand side is coloured “pink” and is the lay side of the market. At this moment in time, the favourite is “Coiste Bodhar” and the current back (blue) price is exactly 3. What that means is, that right now, there is £6 available for you to back the favourite at the price of 3 (these are decimal odds, so a traditional price of 2/1). With a bookmaker, the price that is on the screen is the price you take – however with an exchange you can ask for whatever price and whatever stake (minimum of £2 generally) you want. You could right now take the price of 3, however, you might want to back it at 3.1, for whatever stake you want – and as long as there is another person on the exchange willing to “match” your bet, you’ll receive the price and stake you want. The more realistic a price you ask for, the more likely you are to have your bet matched, however the choice is yours, and you could for example, back the favourite at 1000 (999/1) (extremely unlikely to be matched!) – but the overall point is, you don’t have to take the price you see, the choice is yours. The pink side of the market is the “lay” side of the market. Laying is when you are effectively taking a bet on that selection, and you don’t want it to win. The current “lay” price for Coiste Bodhar is 3.25 (9/4), so if you think it will not win, you can lay it at 3.25 – there is currently £11 available – so for example, if you were to lay it for £10, you’d win £10 if it lost, but if it won you’d lose £22.50 (easy to work out, just imagine you were placing a £10 bet at 3.25 (9/4), your winnings are what you would lose!). Once again, you don’t have to take the prices available, when laying you want to lay at a lower price, so for example, you could try and lay the favourite at 1.5, or 2, or a more realistic 3 or 3.1. When placing any bet on a betting exchange, you have to have the funds available in your account to cover the whole transaction, this is quite usual on the backing side, but on the laying side, the bet will not be accepted unless you have adequate funds to cover the loss in your account. On either side of the prices in the middle there are another two columns, and these prices indicate the next available prices, so if the 6.2 for £2 were taken on the back side for the 2nd favourite National Service, there would be £3 available at 6. As you can see from the screenshot above, the exchanges make it very simple to see your current position on the market. On the above market, bets have been placed on the Seattle Seahawks and the Carolina Panthers (you can back as many or lay as many selections in any market as you want). The green figures show you how much profit you’ll make if that selection wins, and the red is how much loss you’ll make if that selection wins. Being a person to person betting exchange, it is slightly different from the normal bookmaker model of making money through their own pricing. On an exchange the site will charge a commission on every winning bet you have. The biggest exchange, Betfair, have a top rate of 5%, which slides down to 2%, depending on the level of betting activity. So if you were to win £50 on a particular market, with a 5% commission rate, you would receive £47.50 and the site would take £2.50 commission. On any market, as I mentioned earlier, it is possible to place more than one bet – so trading is very popular on the exchanges. this achieved by both backing and laying Atletico Madrid – guaranteed profit on all selections. Obviously this can work the other way, and prices go against you, and you’ll find yourself looking at an all red book! You don’t have to do all of your trading before an event starts – exchanges offer in-running betting on many events, so for example, you may have backed a football team at odds of 4(3/1) before the game began and you find them sitting pretty after 60 minutes with a two-nil lead. At this point, their odds may be around 1.1 (1/10), so you can lay the bet off to someone else, and guarantee a nice profit, without the worry that the other team come back into it. Conversely, if the bet is not going so well, you can always lay the bet off to someone else at a higher price, limiting some of your losses – for example, the team you backed at 4 are now trading at around the 6 mark – guaranteeing an all red book, but having a much lower potential downside. You back Manchester United at 3.0 for £10 before the game. Right now you have an upside of £15 if they win, but a potential loss of £10 if they don’t. At halftime they are leading 1-0, so you decide to lay them at 1.5 for £20. This example would lead to a guaranteed profit on any result of £10. (if you keep the overall liability the same, your book will be completely level, ie home win, draw and away win all produce the same result financially – in this case the liability was £30 – 3.0 x 10= 30 and 1.5 x 20 = 30). You back Barcelona at 1.5 for £100 before the game. You have an upside of £50 if they win, but will lose £100 if they don’t. After 15 minutes their star striker is sent off, and they are now trading at 2.0. You decide to lay them off to someone else at 2.0 for £75. This example would mean you make a guaranteed loss of £25 on any result – better than the £100 loss you might have faced. Trading is popular because you only pay commission on the total market, not individual winning bets. So if you were to place thirty bets on an individual market, some winning big, some losing big, but overall make just £6 on the market, you will only pay commission on the £6, not on the big winning bets. Get started trading now over at the clear industry leader in this field www.betfair.com.